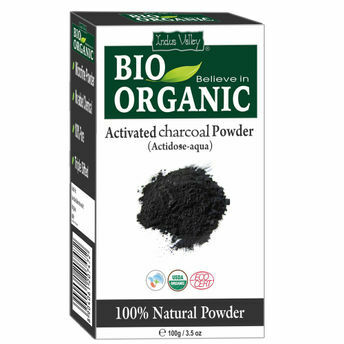 Indus Valley activated charcoal powder is a 100% pure Charcoal powder and is free from chemicals. It is made of activated carbon by heating up carbon in a way that it develops pores in between for capturing the chemicals . It is made by heating coconut shells or saw dust. A activated charcoal face mask made out of our charcoal powder removes the dirt extra oil and greasiness from your face. Activated charcoal is considered to be an excellent beauty ingredient. 100% organic powder with no added chemicals. Micro fine triple sifted powder easy to apply. A health friendly natural aloe Vera powder. Frequent use of this brightens the skin.